If the PRIZE PATROL DROPPED OFF THE $2MILLION CASH, THE LINCOLN MKZ, AND THE BEGINNING CHECK FOR $10,000 A MONTH AT MY HOUSE AT 1819 PAULINE DRIVE, LAKE ALFRED FLORIDA, IT WOULD CHANGE MY LIFE FOR THE BETTER AND BENEFIT A LOT OF PEOPLE; INCLUDING MY CHURCH. You could not find a more deserving person for this winner. LOOK NO FURTHER, JUST DELIVER…I WILL BE WAITING PRIZE PATROL! THANK YOU PCH FOR MAKING THIS POSSIBLE. WITH SONGS TO INSPIRE AND MOTIVEATE ALL AMERICANS TO TAKE OUR COUNTRY BACK! I would Love to be the person to help others secretly, By showing up in others lives when they need help the most. Leave a Hundred Dollar bill for a tip for someone I know is struggling, buy new tires for someone’s vehicle, pick up Christmas lay away ..Buy food for those in need..I am not rich in money , but God takes care of me, and I am rich with family and friends. I would be one of the happiest people in the world by helping others. Thank You PCH..
Hi PCH If I Won It All I Would Help My Family And Others I Would Give Back Anyway I Could I Do That Already But I Would Be Able To Help A Whole Lot More .Thanks PCH For The Opportunity To Be Put In A Place Where I Can Give Back Because I Know People Helped Me Along The Way . If I was blessed To win all the prizes, the first item I would get would be a musaleum to put my dad at peace. May he rest in peace always. I would help my wife out that has Ben taken care of me for 16 years now cuz I am and have had my disease since I was 22 I get no money so if I won I would like to take care of her first the help out the. Homeless give to charity and make people happy and smile. Thank you publishers clearinghouse for the hopes. What I could do with this money to help my family grandchildren to pay for college buy me a house and a cabin where it cool to get away from the heat help the less fortunate and others charities. I could give to our lord and thank him for all this.I would finally be free from bills. Good luck to all and never give u follow your dreams you never know. Thanks Dave Todd and Daniella for all you do. First give at least 10%+ to our church, help family and friends in need. Just praise God for his blessings. I Would Invest Some For The Future. I’d Share, With (1st) ‘Family 3 Adult Children+ Grandaughter’ (2nd) Family 7 Brothers + Sisters. Good Friends, Who Have Been There For Me N The Past. THEN, Beings I Don’t Get ‘To Work ALL Day To MAKE A Living’, I Would Help, ‘ANYBODY IN THIS WHOLE WORLD’ That I Could.. Which Is Mainly What I Do At This Time AnyWay, Beings My Rich ‘Uncle Sam’, Is Who Pays Me,’Social Security’. Which Is Not Much,’But It Does Me Good’.’KEEPS ME OUT OF SELF’. ‘I Get By With A Little From My Friends’. I would love to winn so i cam buy MY Wife a new kitchen and also a cre expecially for here.She is a great cook and takes good care of me. I would first go somewhere for a few days and think about it and get everything in order. The have a day of just relaxing. I would get my 2 daughters set. We are all ready retired so there is not job to quit.so that is why we have to go away so we can talk about what else we are going to do. I have been entering for 33 now ( I know this because you told me) so it is my turn to WIN !! I would first and foremost give 20percent to the Diocese of Grand Rapids to help feed the poor and help the homeless. I would then help my four children clean up their debt,.also I would set aside an amount for college educations for grand children. I would like to travel to visit my sister and my brothers while I still can..would seek those in extreme need and help. I would share with those in need. I have blessed with some of the comforts in life, and there are others who have not experienced any. Should stash some in the bank for my aging years. Pay the taxes due on the winnings! I have never been lucky in winning contests, so it would be nice. It is in God’s hands. Lord willing, I could win! If I won, I would pay for my daughter’s wedding and my 2 daughters’ college debt which are extremely high.. Then I would pay my bills. I have organizations that are dear to me and give them money which include St. Jude Children’s Hospital, ASPCA, Homeless, Feed the Children and Wounded Veterans. Waiting for your knock at my door. I would give money to my loved ones, make a donation, and open my own business. I hope that my dreams are possible. I’M dreaming of winning,then when I do win, I’ll know what to do.In the meantime,, I’ll just pray! I would love,love to win it all. I would not worry any more about money ever!!!!! If I won the “win it all”. On June 30, 2015, Well first of all I have never won anything in my life I never had anything good I raised 3 kids and now they are of age and now I have to raise my 3 yr. old grandson I’m a singal mom never had anything but I raised 3 kids& a grandson now it’s not easy but I never gave up I all ways had to fight for my kids and now I have to fight for my grandson witch I love all my kids and my grandson to I never found the right person but I have now we have been together for all most 14 yrs. now he has 3 kides and 16. And counting my grandson makes 17 grand kides we were planing to get married this year but we just can’t afford to so if I won we could and I would pay all your bills and beleave me we have a lot he has hospital bills I have have some to plus we have other ones to I would pay off everything then get our birth certificates and then we could get married and then I would help our family’s by setting yup for all of our 17 grand kides to go to collage because I would love for them to go and there parents not to were how they will pay for it like I said I never had nothing but this would be what I would do for my 17 grandchildren and remember one 1 is mine but I love them all and then help a some friends that need help to witch I love very much that would never ask for help and help others to . But I have never been lucky and never had anything brand new I would be very surprised but I never think about it I just keep entering everything I can I hops someday I mite get lucky and right now I just had gallbladder surgery to have mine removed I just never get a brake well I wish who ever wins good lucky and have fun ! First I would give my 10% blessings to Jehovah God at my church Summit Christian Center in San Antonio. Then take all 6 grand kids to Disney of their choice or all locations. Lastly visit my mother as much as I could and make her remaining years more pleasurable. I would say thank you Dear Lord. I would help my daughter with health problems and her two handicap boys.Help my youngest daughter get back into college and what ever is left take my husband on a well needed vacation.He also has alot of health problems and myself. I just want to say thank you all its been along ride. Never miss a day! I pay off bills help my brothers and sisters and take time to think about want I would do with the rest of the money maybe have a home built just for me. not sure but I would figure it out that would be for sure donate to ST Judes reseach. If I can sometime win, I will pay over treatment of the my husband and study of my children. After then will help friends and church. I would love to win the 20,000,00.00 + the 10,000..00,+ the car .I have been playing the all the games for my chance to win it all .Thanks PCH y’all could make my dreams come true. I would pay my tithes and then I would pray to my God to tell me what to do with what he has allowed me to receive. My God is my everything! Without him I am nothing. What would I do if I won it all. I would pay off my house pay off my bills buy my daughter a house, I would invest in more share profit on my 401k. I start abbusiness. Give to charities. An save. I am getting on in years. It would be wonderful to have all of my needs taken care of. I would not want my children to have to take care of my bills after I am gone. Winning PCH Win it all would be a prayer answered. So yes I would be one very happy person. if could win I would by me a house. I have seven grand kids to take care of. Plus I would by a car that could carry all of us. I would also help some one else. I been playing for years. I’m praying to God to let me win. See it’s not that I just want to win. I’m trying to look out for my babies. Plus I would put up some for them to live off in case something was to happen to me. So I hope I be the winner on June 30, 2015. Pay off our mortgage and bills and set money aside for retirement and the kids. Would be life changing! Help my parents pay off their mortgage and other bills to include college tuition bills. Both have had to start new jobs in the past year. Yes please i would love to be the one who is the winner of 6/30 and “win it all” sweepstake $2,000,000.00 plus a new vehicle to be in my life would be so much better than the life with out for me and my children who have been dreaming of a home of our own.!!!!! Thank you for the chance to win. I have been playing since 1974, I a proud mother of five, my second son was shot dead. It will be beautiful to take my family some place safer to live. I have a lot of bills to pay, especially with my second degree loans, rent and taken care of my secondarly family. Be able to buy land and built low income home for low income family. It will be nice just for once to have and do not have to live hand to mouth. have to pay PCH bill, from ordering. Buy one item to be on be on Presidential Elite. No need to order to win?? But an order would be nice. I just wonder if it is possible? I would 1st, pay off my morgage,Then,I would buy so much groceries,we haven’t been able to afford that.We paid monthly bills,etc. Pay off ALL depts. Take a long needed Family vacation: There are also few people I would like to help. It would really be a blessing for all concern. I’m ready for this “Win It All,” on June 30th 2,000,000.00 plus 10,000.00 a month, and I want it all and a new Lincoln MKZ GWY$ 4900. Pay off college debts of grandchildren, build a house, new bathrooms, etc. for our church, get a new car, be able to take care of personal health provisions that insurance won’t cover. And, always be there and able to help those who need help! I would first thank my heavenly Father God almighty and donate 10% to my church. Help my children, put money away for my grandchildren’s college fund. Pay off credit cards and take a honeymoon with my husband of 40 years that we have never. Alter that take a family vacation and fixed-up my home. Just wanted tO say hello to all the fans of PCH and wish them plus myself Good LiLuck may a smart winner be sought aNd foynd. And remember the winneings can cause yoy trouble if you sont invest properly. Nowing how to spend and save are keys to ypu and your family success in life, once again GOOD Luck. 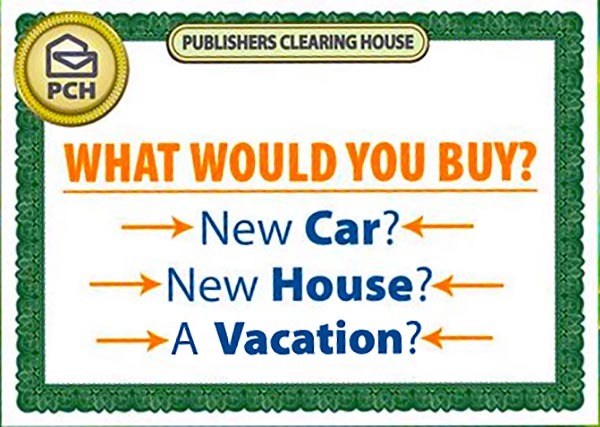 I would love to win the PCH sweepstakes to pay off my mortgage, car note, student loans and bank loans. I would also love to travel with friends and family members and assist them with their finances. I really love the games and winning tokens. PCH what would I do first if I won it all. I would thanks God, PCH and anyone that had anything to do with me winning. I would give my tides and offerings pay uncle sam his taxes. Get a finical planner Give to my charities and help several people I know that are in need. Depending on how much I won would depend on how much I could give away.Help my grand kids out with collage educations help my kids and set up a trust for my grand children and kids buy me a new house not on a slab floor take some trips. One thing I want to do if I am allowed go to PCH head courters and thank everyone. Thank the the people behind the sense . Buy me anew car and wardrobe. then just help people. Well the first thing I would do is pay off my oldest son’s school grants. He’s going to school to become a Certified Diagnostic Technician..yes a mechanic. I’m proud of him. Well that said, he says he would like to have his own (mechanic) shop. But he wants it all family. With that dream for all my children telling him yes, I wouldn’t want him having to pay student loans and wanting a business. (By the way, he is at the top of his class. Soon his sister and brother will be right there with him. They are about to graduate. My daughter next year and my other son a year after.). Good luck and God Bless!! The first thing I would do, help my Church, the homeless that lives under the bridge, my family get my mother in a safe place where she will be taken care of.I’m renting the home I’m living buy it, if it possible, home repairs, build a kennel for my dogs they will have their own space, pay off my bills, help my friends that was there for me. After I get everyone on track I will live and be happy and thank GOD for everything he as done for me and my family. PCH. 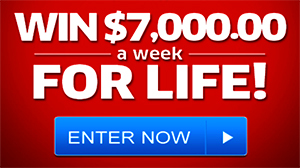 WIN IT ALL-DREAM LIFE PRIZE OF $2 MILLION CASH ,$10,000 A MONTH FOR LIFE AND A BRAND NEW CAR GWY NO. 3080 ,I WANNA IT ALL” ALL MY FINANCIAL BILL’S TROUBLE, ALL MY STRUGGIMG WILL BE OVER .THIS WILL BE A LUXURIOUS LIFE STYLE SWEEPSTAKES I HOPE PCH CHOOSE ME. I help my Mom out of her debts where she want have to worry about how she will pay another bill and dont never how to go to churches for help i will give back to all those who gave out a hand to help. I will build a safe house for drug abuse and abusive women s and there children. I pray for this everyday. All i can ay is Thank you Jesus because i do trust him. Have You Help The Needy?, and Sponsored? That’s the first thing I would do. I would pay off debts, help my grandchildren to go to college and buy better health insurance. I’d make a major gift to my college for a new performance center. After it all sunk in that I did win then I would get a lawyer. Then pay all my hospital bills, get insurance that is good. Then I would help my kids and grandkids out. Then buy a new camper and pick-up so my husband and I could go on a real vacation. We have been married 46 years and never been on a real vacation that lasts more then 2 days. The oats in Knox County would benefit as well. I want to win it all! My plan is to first set aside 10% for charity in my community. We have A LOT of folks who cannot make ends meet and need help with food, clothing, warmth in the winter, bills, etc…. There are some charitable organizations that try to help out, but they continually run short (the food bank, a clothing and supply place for mothers and children, the local senior center, the center for domestic violence, and a few more). Second, my own family is in debt and I want to pay off EVERYTHING so that we can afford to do maintenance on the house, fix the driveway and bring me home to be more available for the kids. Third, I want to purchase the local Legion Hall in our community. My dream is to oust the bar downstairs and turn it into a bookstore/gift shop with an organic/kosher cafe and juice bar. The Legion would be able to continue to meet on the upper level at no charge, and there would be an elevator installed so the folks who have a hard time getting upstairs would have easy access (the legion had looked into an elevator, but they dropped the idea as the cost was too high for them). The legion would no longer have to deal with the upkeep of the building, taking a lot of financial stress off of them. The upstairs would also be available for other community events. Additionally, there is a widow in the community who is loved by all and she is having financial hardship. She likes to stay active and so I would like to have an office/work area built for her in the legion hall from where she can operate at no charge. Finally, I have two boys who would benefit from a college fund, and there are places I would like to see in my lifetime and share that with my husband. As for winning a car, I have dreamed of owning a Trans Am since I was twelve. Not just any Trans Am, but a custom-made Hurst edition from the Trans Am depot in Florida. So there you have it. Thanks for taking the time to read. First thing is first on my list, and that is looking for homeless people here in Hawaii and giving them food certificates, Blankets, Clothing, Tents, etc. Also continuing donating to RBC Ministries, Saint Jude Children Research Hospital, Easter Seals, DVA, National Law Enforcement along with many more foundations but at least I can give more than before cause Jehovah God call all of us to give and have compassion towards the less fortunate and those who don’t know the name of Jesus. As poor as I am I will give my last cent to them. After all of this things that I mention is done than I can build that house on my family land and make my family happy cause finally one of us building their dream, and that’s a OHANA HOUSE so everyone has a place to go to. Especially a place fill with love and aloha. I’ve never been anywhere in my life before. This world is a big place where family and friends scattered the globe. This would be a good time to visit them and also visit the foundations that I contribute to in person. Much more things I would like to do PCH. Just bring that DREAM PRIZE and let my dreams become that reality. Not only for me but for everyone surrounding this blessings from you folks. I would take the family and close friends out and just be with those how are truely close to my heart..
First would give thanks too god, then get my disabled children the food and clothing that they never had and the diapers we go through,. it would be a miracle ,. ,. Ansure your qusion what I would do if I “Win It All” . making lots of phone calls to my other family back home to make reagment with them. I would buy me a private jet plane. Well anyways I have put in my entry gwy #4900 . I know winning won’t change who I am , but I will definitely help others in need that’s who i’ve always been. First I would hug and kiss the prize patrol ! My whole community would not believe that I won! I’ve never won anything in my life! The first person I would give money and take care of is my granny. I would have every thing she needs or desired. She wouldn’t have to lay in a bed and I could hire physical therapists, cooks, and I would have the prettiest landscaper to do her yard with beautiful flowers everywhere! This would be two dreams come true , because she truly is an angel! I would pay my bills first then relax with a vacation for about few years. So I can think of how I’m going to bless other people in need. Win It All -Dream Life Prize will make all my dreams come true ! Money could help lots of problems, personal and political. Family, Home, Investment, Vacation, in that ORDER.but mostly take time and think before I do anything else. Family, Home, Investment, Vacation, in that ORDER. Take care of family and by a HOME !!!!!!!! I would pay off my student loans, pay off my house, and put away for retirement. As money comes in I would start a scholarship fund for budding artist, help my family, and help the food bank. Since I wouldn’t have to work anymore I would devote more time to my own art. I would also save to go see the Sistine Chapel. I appreciate great art, and some of the greatest art ever created is there. I would lay on a pew and stare at the ceiling all day long until they threw me out. I would have had the one dream I have always wished for come true. No make that two wishes. Paying off my student loans is the second wish. Just winning enough to pay those off would make my day. Then I wouldn’t feel so depressed anymore. I will DEFINETELY be GOOD to those who were GOOD to me. It’s nobody else’s fault but your own . So you should always treat others how you would like to be treated . Because one day you just might regret it . First I would give some money to the church. The the dog kennel. My husband died and l lost my new home. And I had to do the B word. I have doctor bills so many of them. My daughter died 8 months before my husband so I wold like to get her a tombstone her husband was to get it and he didn’t so that one thing I want to do. And now I live in a basement apartment and my little dog can’t see out from a door so I like to buy a little place with frence so she could get out. And help my family. Greetings, PCH, from the Panhandle of Oklahoma! To win it all would be such a blessing to our on going medical challenges and the 5 hour monthly trip to seek this medical necessity! There are family members who are in need of financial assistance with their on going medical challenges as well this win will be paid forward to assist them! Financial security will be established for our children/grandchildren, all student loans paid in full, and a much needed family vacation to Disney World and all special holidays to reunite our children/grandchildren! Thank-you, PCH, for making dreams come true for persons with medical challenges such as ours! It will be humbling as well as an honor to represent your organization in our geographic area with the big winning claim entry! I want to win,I’m going to take care of all my children.and their children,help out my foster care agency that I used to adopt.go on vacation,enjoy my new life,PCH Please I want to win. When I win it all,I’m going on a vacation,return and enjoy my home and new car.put money away for children college,and grandchildren,go back to school myself.give to my foster children organization,so they can keep providing safe places for the children,and wait on the 13 Children/two adopted one’s,Two biological ones to come home.we will have more space.and I can help them more.I love them all. I want to win.it will help me so much.I can do things for my children. I WOULD BE EXTREMELY EXCITED IF I WAS TO WIN A NEW FORD FUSION HERE AT OUR HOME ON THE 27TH OF THIS MONTH FROM THE PCH PRIZE PATROL AND THEIR ELITE TEAM. MY DOG BLACKY WOULD BE THE FIRST ONES TO SEE YOU BEFORE I WOULD. HE IS A BLACK LAB, VERY FRIENDLY AND HE DOES NOT BITE. HE REMINDS ME SO MUCH OF BINGO, HE IS SUCH A LICKY POOH. YA ALL HAVE A GREAT,HAPPY AND WONDERFUL DAY, STAY SAFE, WARM AND WATCH OUT FOR THOSE ICY ROADS OUT THEIR. THANKYOU TO PCH PRIZE PATROL AND YOUR ELITE TEAM. Publishers Clearing House I Will Not Win Immediately But It Will Be Definitely.Amen. If I won it all the most important person I would thank is God and PCH. PCH has been a large part of my life sense I have been of my computer plying and GOD is the very biggest partner I have. he is my Lord and savior.PCH it the best of the best and Yes I would love to win it all only If PCH and God Sees fit.. I miss PCH when I can’t be on and lately it has been hard to get on with the Death of my husband and company often lately but soon I will be back for good and a long time I hope. I love PCH and I thank them for allowing me to play there games. Publishers Clearing House Thanks A Million For This Epic Opportunity Ready 2 Win.Amen. First I would need a chair !!! This would mean a life changing gift! Pay off my home, College Paid for my teens. More time to spend and enjoy with my Love ones. Give back to my community and help make another single parent ‘s dream come true by giving a generous. Gift. But after I pay my home, Ii would plan a Minnie family getaway with my children and make a wish come true for my sister who truly deserves a break in life a Story to share and Inspire. Money can restore joy and peace of mind. God bless All. I welcome PCH to my humble. Home and friendly hometown. I am so happy to wake up every morning!!! Thank Publishers Clearinghouse for the opportunity. My Mother and Father. And the the people on Facebook who like to have fun. Wish you BETTER LUCK in life ., and I know it’s hard but keep your head up and things will hopefully get better .. My prayers are with you and I hope everyday gets better and better for you . God Bless You . Publishers Clearing House I’m Asking Myself Is What I Doing Today Is It Getting Me Closer To Where I Want To Be Tomorrow Amen . The reason I am praying to win this with every bit of life in me is because In September I scrapped up all money I could to go to my nieces wedding in Arkansas as I live in NC and to see my son I hadn’t seen in 2 years along with my 4 yr old grand sauger n new baby boy grandson !! So excited and the trip was wonderful ! Till the last night there the night of wedding someone had dropped ice water on the floor and my leg folded like an accordion . I had a it shattered my leg.starting at ankle . Broke off my tibias plate crushed my knee Not to mention all the leg met and tendon damage. Thank god I had insurance that paid portions ! But now that it’s new year all deductibles are do I can’t get any of care I need I have so many doctor appointments up to 3 a day and copay is 10 when u are not working how can I ??? I can’t !! I’m stuck I’ve used all resources from churches to Salvation Army that is very humbling and the first thing I had to do learning then u can only use these institutions for aid once a year !! was I had surrendered my vehicle back bank just to pay that first mo rent that was the first month .I have skid by borrowing from all I can .. sold every single thing I ever had of any value at all from family air looms to art work all jewelry movies TV’s just everything !!! It started in September .. This is not a potty story !! I had to have plates n rods put in my leg and the healing from just the tibular completely braking off n crushing all around it takes 1 year to heal so I have not been able to bear Weight only 25% and I can not use crutches cause I broke my back 15-16 years ago and the crutches flair my very damaged nerves from that ! I have other health issues that need not be mentioned … My point is the first thing I would do is get a excellent ins and get better ASAP and I would use remainder to fix my credit from all this but not before I started some type of business that helps these people that fall threw these cracked of social security welfare and all other so called institutions that u pay into all ur life and when it comes time for u to use it when u for whatever reason need help well I want to help these people with resources and money and do all I can to help people who from one fatal moment lose it all ! I was always just getting bye in life not rich scrapped by but I survived ! But I was rich in self love in happiness I was grateful for the little barley get by life I had !! I used to be told I light up the room like an angel when I walk in I was positive n known for lifting people up n help anyone I could from a hug to a ride to a whatever was in my power to help and lift a soul !! N now.. Well I’m just opposite I am depressed sad stressed can’t think of one thing to smile about and that for a person like me is just disgusting and when something like this happens ,I can see how people end up as a bum , homeless or simply give up !! As of the new year I can’t get any of my medications do to deductible I can’t continue treatment do to deductible and I will be homeless as of February !! I’m 41 year old kind hearted woman that’s always been VERY STRONG. I’ve had a rough life n it makes me stronger “I thought ” I’ve already looked into how to make a website for people in need all the things I have experienced dead ends paths to get little here n there and I would love to help others not have to go insane trying !! And that my friends is what I would do !!! Thank u for ur moments of reading !! For those who are doing well in life I can only say cherish every moment for it can change n one single second !!! PCH for making my life easier. No more worrys . Just that alone gives me a feeling of calmness. Really need to get away , alone , just myself and my Lord Jesus Christ so I can talk to him ! Somewhere where I could really think about things and just EXHALE !!! I WOULD LOVE FORE MY CHILDREN TO HAVE A BETTER LIFE THAN I HAD! I would pay off any debts first all unpaid bills and i would donatate to ronald mcdonalds house for injured children ..awesome charity and get a financial advisor…and thank god every day after that..screem i won….that would be amaizing. 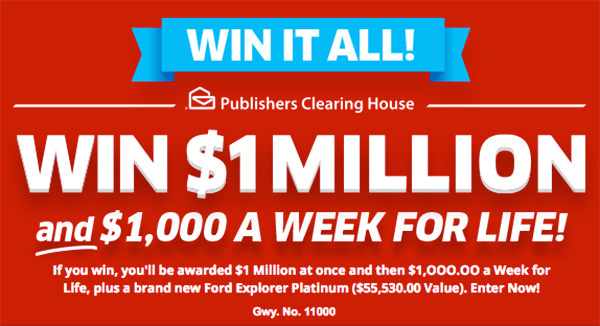 I do like to win pch millionaire GWy.NO 4900.3577.3818 prizes i well go back to school from massage technology. I have never been lucky with sweepstakes or lottery but, if I did win this one, I would probably feint and miss all the fun. When entering sweepstakes you want to win, but you need to think of others also. I wish everybody good luck, think of someone to help out and have a Merry Christmas. Good luck to all. Ready To Win From #4900 Publishers Clearing House Amen . local hospital where I have been taken care of me so that now I am so happy to wake up every morning!!! HI PCH Remember little old me. I am still here trying my heart out to win it all. You put in my face to win so I won’t go a way now until I have it all. Well l unless your run me off .Please keep me and show me the way to win it all. PCH a Car, two million dollars and 20,000.00 wow just for me.